Sundial Bridge to Shasta Dam is a 38.2 mile moderately trafficked out and back trail located near Redding, California that features a river and is rated as moderate. The trail offers a number of activity options and is best used from March until October. We recently completed 2 Terra Trike Rovers for Carl and MJ from Redding, CA (pictured above). Both bikes were fitted with BBS02B 750 watt and Hailong3 48v-17.5Ah battery packs. We also installed a gear sensor on Carl’s bike since he is running an 8 speed Sturmey Archer IGH. MJ is running a Nuvinci IGH and did not require a gear sensor. Both bikes retained their “parking” brakes and used Hidden Wire Brake sensors. We are so sorry for Carl and MJ. About a week after they got their ebike conversions, and were beginning to really enjoy their new rides, all Hell broke loose in Redding. 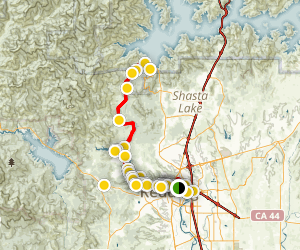 It appears that most of the beautiful trail going to Lake Shasta was consumed by fire. I communicated with Carl and MJ after the news of the fire and learned that they were safe but the fire had burned all around their home devastating thousands of acres. A story that is all too common in California. Especially in recent years. All our best to Carl and MJ. A new tool to help extract those hard to get to 8mm bearings which support the ends of the motor rotor on the BBS01/02 and BBSHD. This tool will be on the website shortly. For anyone who has tried to replace these bearings will know they are next to impossible without the proper tool since they are both in a blind hole recess. Watch for this tool in the “Tools” section of the website. Gates Carbon Drive . . . more info! Gates Carbon Drive has publish a new manual of specs for use with the Bafang Max drive motor.For purpose built bikes. Frank has some hills to climb on the mountainous side of Berkeley that are more than 20% grades and with the 11×48 cassette on this bike they truly are a piece of cake. Frank loves to ride with his wife and stay in great shape. He even has a heart rate monitor on his bike and has to be careful to not over do the pedal assist so he can keep his heart rate up. There was a lesson learned though from this build. Frank was getting an annoying noise in the higher gears of his bike, especially when climbing. After testing, we discovered that the cassette body on his rear wheel was made of aluminum and that it could not take the torque stress of the mid drive. We replaced the aluminum body with a steel body and all the noise has now gone away. Tor Stahl is a commuter that did his homework! According to Rolhoff: The maximum rear sprocket input torque must not exceed 100N and this is something that the motor vendor may not be able to provide as it depends on the primary transmission ratio you’ll be using and of course you would also generate torque yourself. 20’’ front Wheel with SPINNER Aluminum Suspended fork. Rear sprockets 17-19-21T and spline carrier. I finally succeeded to install my Bafang BBSHD on our Pino semi-recumbent Tandem. I found out I needed a 100mm axel to fit with the double crank of the Captain bottom bracket. I inserted 3 x 12mm spacers on the left side of the axel to fit with the left side front chain ring. Ouf…it was creative as you mentioned on your previous email! As planned, we went for the SuntripTour 2017 in France last June with our Pino Tandem and Solar trailer. Unfortunately, the third day, we slipped on wet ‘’pavements tiles’’ and my wife double-fractured her pelvis. I recently got acquainted with Anne & Mike Poe of Hiking Biking Adventures as they are in the process of moving to Slovenia. Anne needed a couple of batteries sent ahead to be ready when she and Mike arrive in June. If you check out their HBA website you will find they are real pro’s in the endeavor of writing and describing their adventures. Their guidebooks give you wonderful detail and descriptions of their own experiences so you may discover the same wonderful trails armed with very helpful insights. As the Ebike rider base continues to expand there are more and more people discovering the enjoyment of riding an Ebike. Not only the avid bike riders but many others want to get more exercise and rediscover the great outdoors. They are finding the adventures that Anne & Mike describe in their guidebooks once again doable. Having this information readily available for the new explorers is very exciting and much needed. Thank you Anne & Mike, we will continue to follow you with your new discoveries! The Juin Hydraulic brake system is the simplest solution for adding hydraulic brakes to any bike that can accommodate disc brakes. There are no hydraulic lines to fuss with and best of all, you use the standard Bafang cable brake levers with the electric cutoff. Also, for those who want to continue to use, there are many that have high end or Parking Brake levers. This system would allow for that by adding in the Hidden Wire Brake Sensors. Maybe some good news to Ebike owners wanting to use the Gates belt drives on there Ebikes with IGH. As of March 2018, Gates now offers a CDX belt ring and cog which are Di2 specific. There is a particular offset which I believe may accommodate an Alfine 11 IGH with the BBs02. I have the cog and ring on order and should have them in hand by the end of the month. I’ll report back with findings! We will post the results of Christopher’s install as soon as he gets back to us. We appreciate this kind of support. Finally, a component to relocate the mounting holes for your Downtube battery without drill extra holes. B-RAD, which stands for Bottle Relocation and Accessory Device, is a system for organizing downtube battery mounting using bottle cage mounts. Available in two sizes, B-RAD bases can shift a bottle cage away from rear shocks, add room for tools or tubes below a bottle cage, or even provide space for a second bottle on downtubes. Click on image below to go to page.